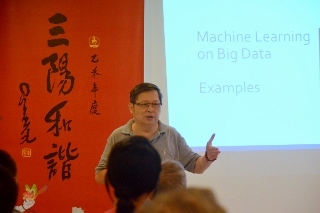 Big Data is certainly one of the hottest topics nowadays. But what is Big Data? How does it impact our life? Dr. Pen Chiang, CEO of Redix international Inc., explained in a special “Future and Hope” lecture held at NJBCC on 9/19/2015. He first defined Big Data with three V’s: big Volume (more than 1 TB), high Velocity (data is coming extremely fast) and Variety of data, which includes structured data (rows and columns) and non-structured data (audio, video, image, hand-writing, blog, tweet, and document). Dr. Chiang pointed out Big Data is a very powerful tool that can be applied to descriptive, predictive, discovery and prescriptive analytics. Two types of Big Data Technology are now in high demand in every industry sector: Machine Learning and Map Reduce (Hadoop/ NoSQL/Spark). Dr. Chiang used the famous “Cat Project” to elucidate how machines can do image recognition via Neural Network (or Deep Learning). He then used NJ Census as an example to explain the Map Reduce concept. Several useful applications of Big Data/Machine Learning include spam detection in emails, Real-Time Speech Translation, text analytics in a call center, and self-driving cars. The audience just loved those easy-to follow examples. Dr. Chiang pointed out “Industry 4.0 (or Internet of Things, IoT)” already affects our daily life in many different ways. For example, the first robot-staffed hotel officially opened on July 17, 2015. We can use a $99 Intel Edison and a bunch of sensors/shields to build our own smart home. As a member of NJBCC, Dr. Chiang can’t help but wonder how far away we are from the Ultimate Bliss described in the Amitabha Sutra. He said we may be able to figure it out with Big Data in the next 30-50 years. On the other hand, Buddha already had the Big Data concept more than 2000 years ago! The technology paradigm shift also demonstrates that all conditioned things are impermanent. Therefore, there is no need for us to addict to anything. 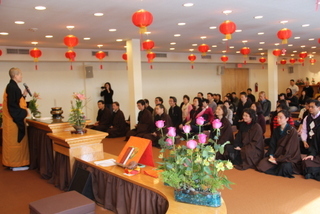 On Feb. 28th, New Jersey Buddhist Culture Center invited the Ven. Hui Kuan, Executive Director of Yangzhou Jianzhen Library to give a lecture about emotion management. Although the weather was terrible, there were still around 100 members participating in the lecture. During the lecture, Ven. Hui Kuan illustrated the principles of emotion management by using various cases that he had helped with in the past and providing understandable examples. 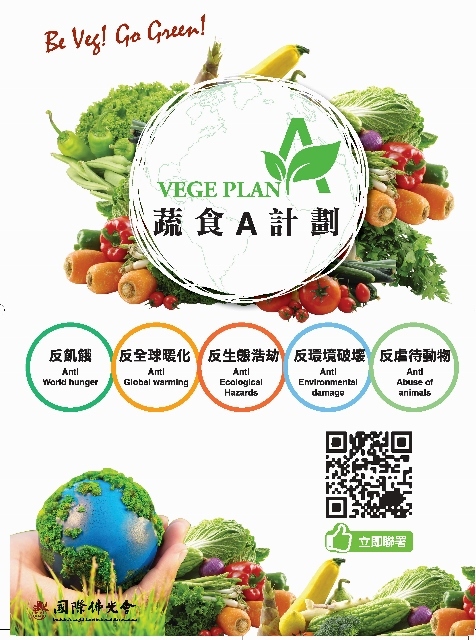 Begin with the issue of IQ vs EQ, Ven. Hui Kuan talked about how to understand personal emotions. He also mentioned that people who believe in religions tend to come across less stress compared to whom don’t, especially Buddhists. Ven. Hui Kuan then transitioned to the fact that life always comes with emotions. And Buddhism teaches us to manage our desire and inside conflicts, where emotions raises. Buddhism could improve our ability to manage our mind and give us the wisdom to keep calm and positive. Ven. 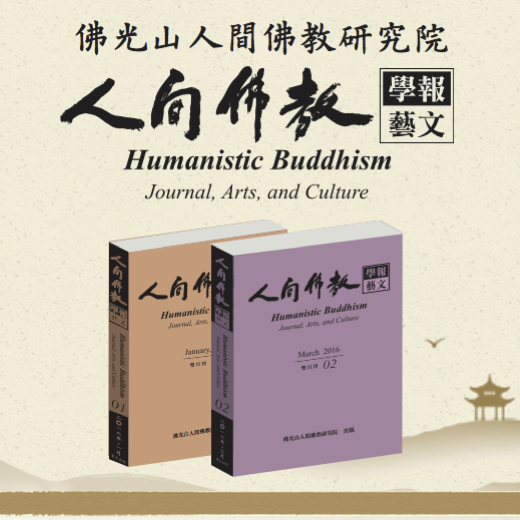 Hui Kuan then moved to encourage audience to learn from the Buddhism and pay attention to the opportunities around us. “Live at the moment”, he said. Make a movement if you need, stay stable if that’s necessary, or stop whenever it’s valuable. He addressed that people should practice what they learn from the Buddhism in their daily life, keep positive all the time, and never miss the opportunities even during difficult time. Following the three simple rules could surely help us improve our emotion management skills. Ven. Hui Kuan’s humor brought the entire speech fun and joys. Reflecting on the night, Ven Hui Kuan offered an interesting lens through which to understand and manage emotions. 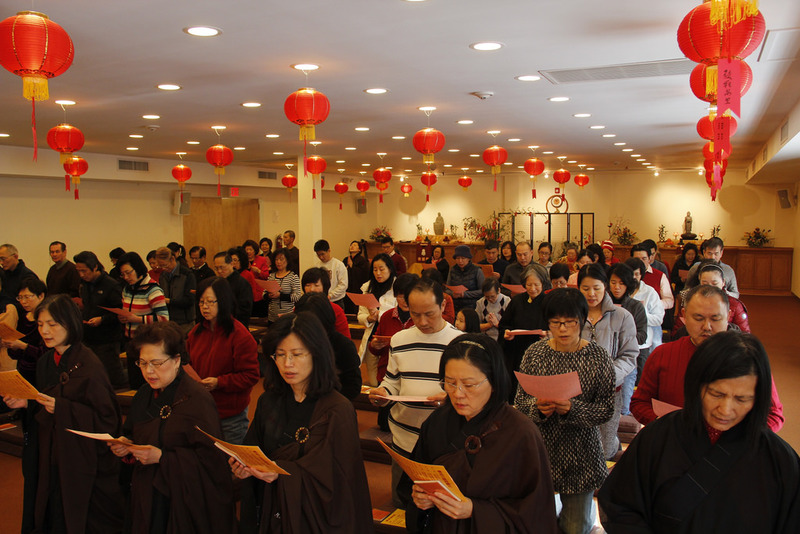 In order to celebrate Chinese Lunar New Year, New Jersey Buddhist Culture Center (NJBCC) conducted a series of events from the Chinese New Year Eve to the Third day in the New Year. 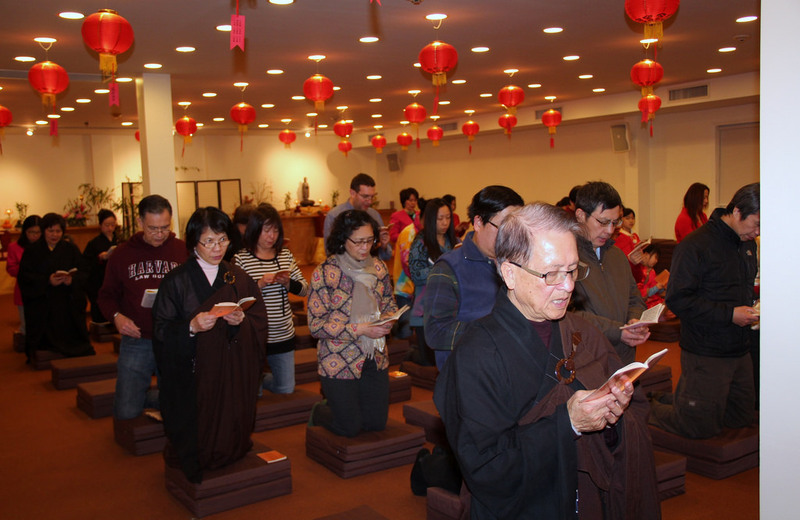 Since the New Year's Eve, January 30th, followers in New Jersey region went back to temple and spend this special moment with Buddha. People made incense offering and light offering in front of Buddha, made New Year wishes, and reviewed the past year. On the first day of Chinese New Year, temple opened to the public so everyone had the opportunity to celebrate this special festival. According to Chinese tradition, women should visit their parents’ homes on the second day in the lunar new years. Hundreds of follows came back to temple, which was characterized as home, with happiness and joy. And the Abbess, Ven. Chueh Chuan, led everyone to pay respect to Buddha and pray. nsibilities in the Year of Horse. Besides the best wishes for every visitor, temple also prepared red pocket with presents inside, festival scrolls with Master Hsing Yun's calligraphy, as well as steam sponge cake and oranges, all of which implies best luck in the New Year. 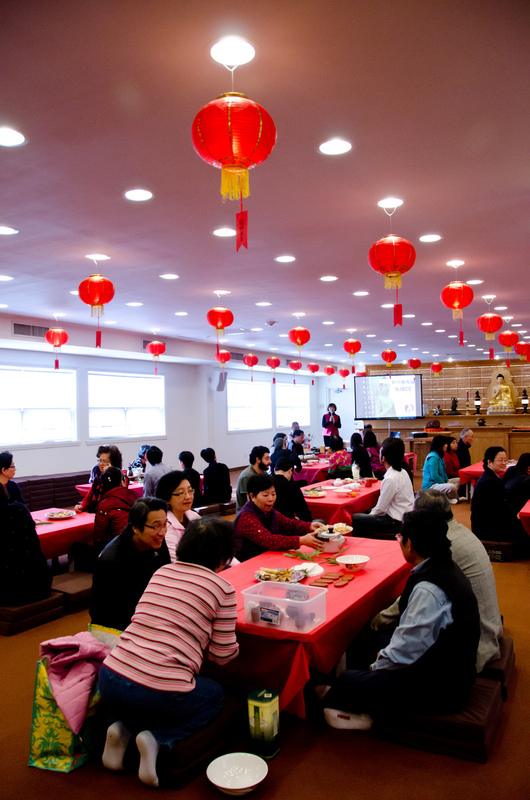 On the third day of the Chinese New Year, the temple planned and implemented "Tea and Music." 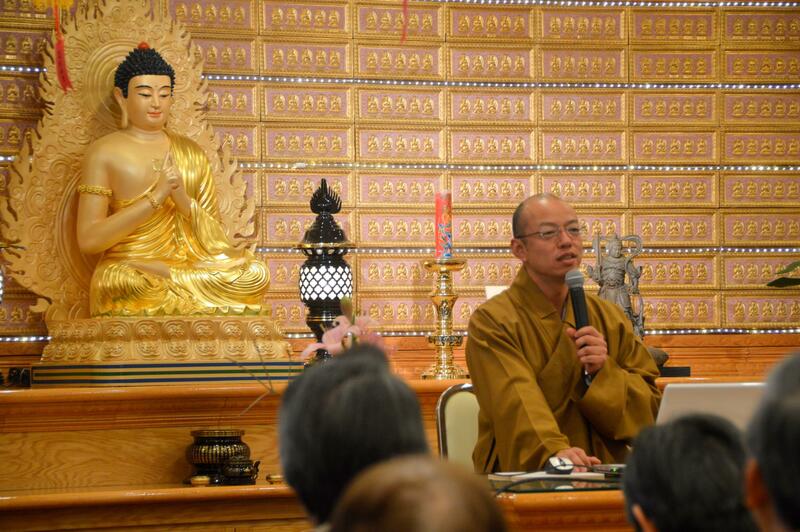 Mr. Bailu Wang was invited to share his experiences in making tea and learning Buddhism. 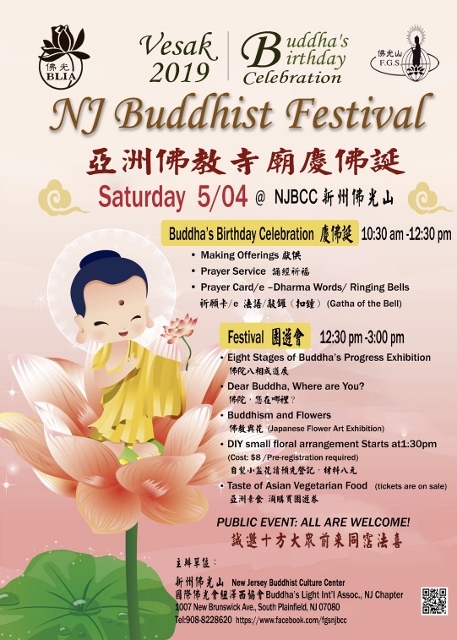 Members of New Jersey Buddha's Light Youth Chinese Orchestra played Chinese musical instruments during the event. 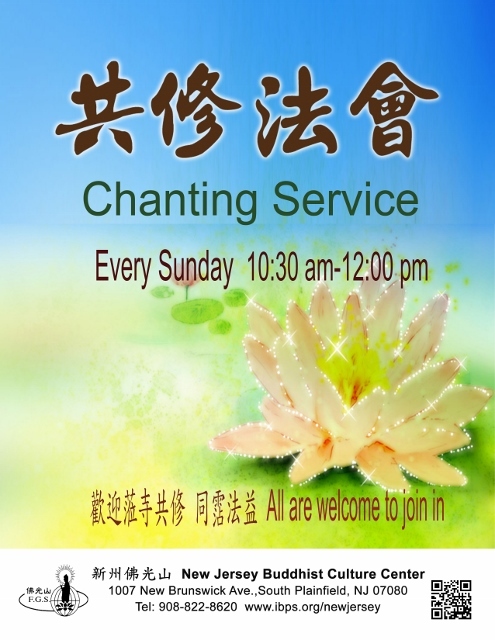 And the Chinese Buddhist music performed by Fo Guang Shan Buddhist Choir was shown on DVD as well. 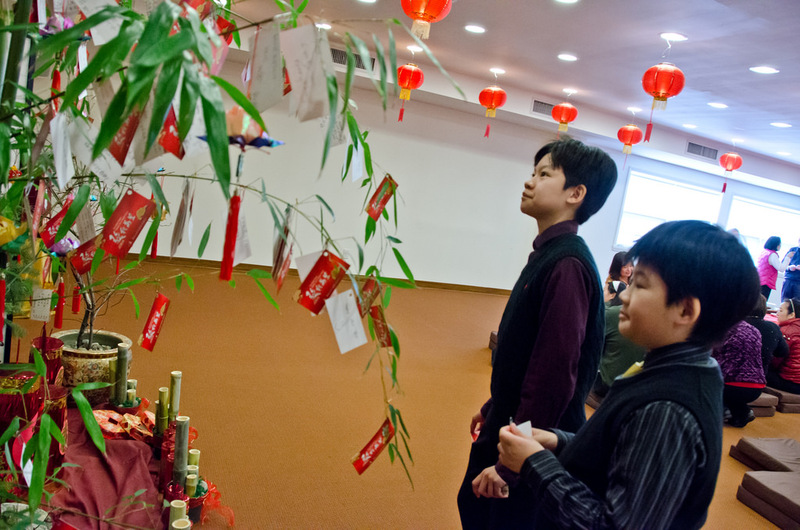 Through exhibiting and conducting various traditional culture events, NJBCC expresses its best wishes to every visitor at the beginning of the Chinese New Year. And every visitor had a great time during the festival.